I was rather surprised to see that this article (PDF/Dutch) didn’t generate more buzz in the Belgian blogosphere. Let me explain. It’s sales period in Belgium as always during the first month of January. These sales are indeed only allowed a certain moments of the year and are heavily regulated. I won’t go into the details as it’s not to the point (and I would have to look them up ;)). So in reality they’re only giving like 30% off versus what they are advertising right now. According to the folks at the Federal Dept. of Economics what happened here is legally allowed so case closed. GM: You’re the best! Let’s go get them. Common practice? According to some it is. Legally ok? Apparently yes. But what I remember from Mango is that they have made it clear they shouldn’t be trusted. Happy shopping. But the answer I got from Mango, is that the price underneath is the price in Spain and Portugal, which is lower than the Belgian price due to import costs etc. But I don’t understand how they are suddenly Spanish tickets hanging on clothes in Belgium. I can’t image that they import these clothes from Spain just for the sales period? Good to see they came back to you… I don’t buy it though. I don’t know much about fashion retail but that answer doesn’t make sense to me. Great posy. No doubt about it. Mango are duplicitous. However, apparently this happens all the time. 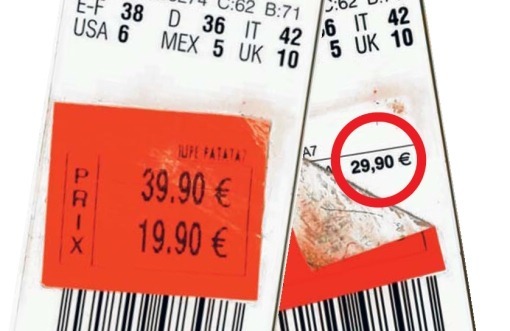 You and I may not be shopping experts, but my wife reacted with a casual “of course darling, everyone knows that, I aways peel off the label in the shop to see what’s underneath”. Even though people see right through that kind of thing, it doesn’t mean they won’t be lookng for a bargain at Mango anymore. It’s just a very transactional, loveless relationship. And it seems that Mango thinks that’s good enough. Happens all the time… as I said, that’s probably very true. Don’t like it more because of that though, still tells you something about the value those brands give to the relationship with their customers. Pretty loveless indeed, and not very respectful if you ask me. Me agrees. Just because it happens all the time doesn’t make it less worse. On the contrary. Sales in Belgium are a big joke. otherwise you get these kind of situations.